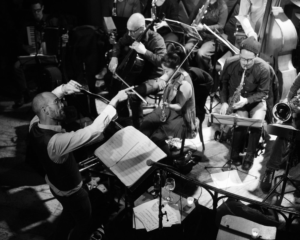 The thrilling dynamism of the Michael Leonhart Orchestra will be here for a fourth consecutive month at Jazz Standard when the MLO return for this special one–night stand. Steely Dan, Bruno Mars, Meryl Streep, and Ringo Starr are just a few of the many art­ists who’ve sought out Michael Leonhart for his ex­ceptional skills as a composer, arranger, producer, and instrumentalist. But the MLO is the project closest to his heart, and its spectacular butterfly–inspired concept album, The Painted Lady Suite (Sunnyside) captured all the power and beauty of this 21–piece band.